Heat oven to 375°F. Spoon a few tablespoons enchilada sauce in bottom of 9-inch pie plate; set aside. Heat 10-inch nonstick skillet over medium-high heat; coat bottom of skillet lightly with canola oil. Fold 2 tortillas in half to make half-moons, and place in skillet. Carefully open tortillas, and place 3 tablespoons cheese in each tortilla, along with a small spoonful of green chiles, and fold the tops over. Cook quesadillas on each side until golden and cheese is melty; remove from skillet. Repeat 4 times. Shingle quesadillas into pie plate, overlapping each a bit. Spoon remaining enchilada sauce over quesadillas, letting it seep between each quesadilla; sprinkle remaining cheese over top, and place pie plate on cookie sheet. Bake about 20 minutes or until edges begin to brown and sauce and cheese are bubbling. Cool about 5 minutes before serving. Serve with remaining ingredients. You can serve these quesadillas as whole pieces or cut into wedges like a pie. Both are totally delicious and give each serving plenty of cheesy goodness. If you prefer, substitute corn tortillas for the flour tortillas for a more enchilada-like preparation. 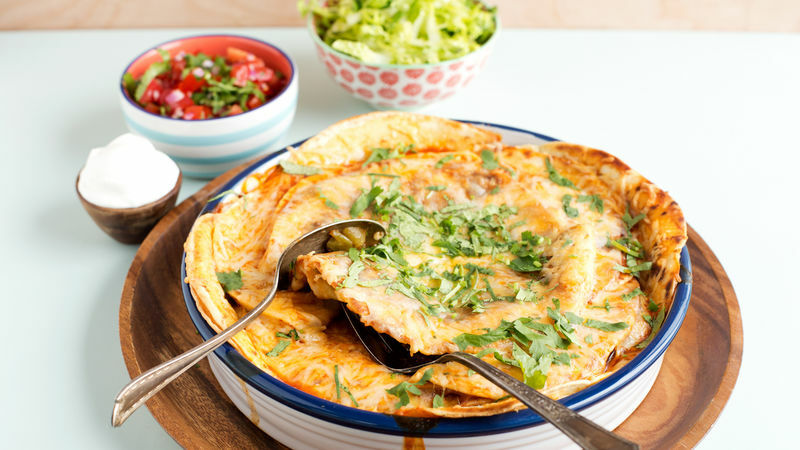 You can stuff these quesadillas with much more than cheese! Cooked chicken, taco-seasoned ground meat, or roasted vegetables would all be delicious options.